Tuesday January 21st 1902. I did a very little ironing in the forenoon and got dinner. George & Flora with Willie & Carrie were here for a visit which we enjoyed. Weather pleasanter. Wednesday January 22nd 1902 I finished the ironing in the morning and in the afternoon did mending and other sewing. Will took a couple of hogs to North Liberty to be dressed for us. Thursday January 23rd 1902. I was busy with the house-work all forenoon having churning and bread baking on hand. I went to town with Will in the afternoon. Did some shopping and went up to Nell Swishers where Will called for me It turned very cold again this afternoon. Friday January 24th 1902 I was busy with the work all forenoon. Will went to town in the afternoon and I went as far as home and spent the afternoon. was at Fannies awhile to take eggs down Mollie went down home to stay all night. 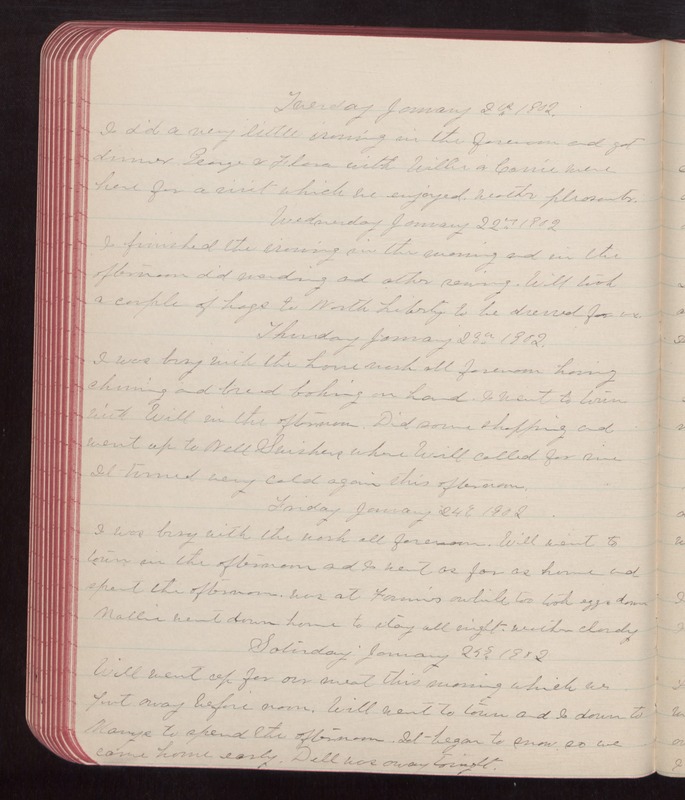 weather cloudy Saturday January 25th 1902 Will went up for our meat this morning which we put away before noon. Will went to town and I down to Marys to spend the afternoon. It began to snow so we came home early. Dell was away tonight.